Love, Love, Love. Valentine's Day is every day. Every day we do and receive so many things which derive from love. Things which we sometimes even take for granted. But, we should always reflect on what really keeps us going and that is love. Happy Valentine's Day to all of you! 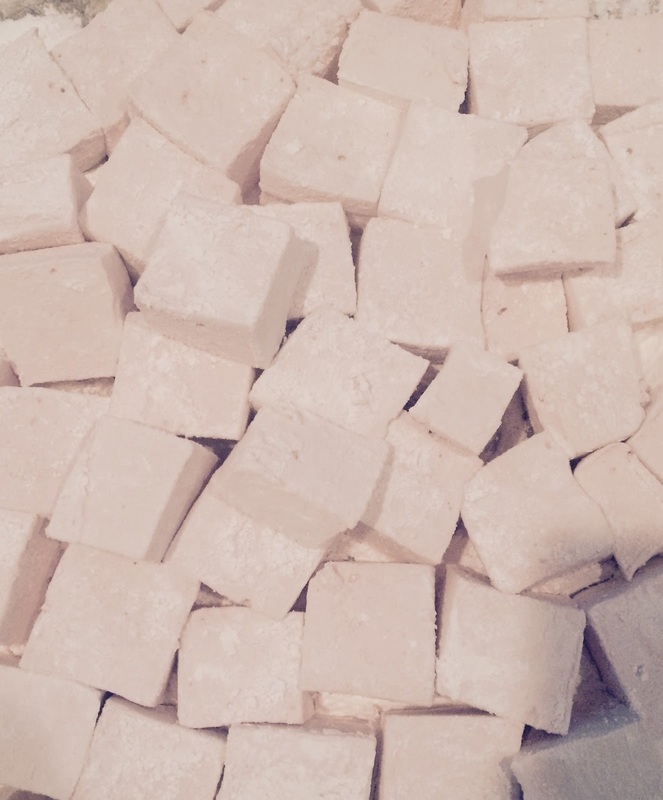 These marshmallows are so good! Ideal present for the children (and grown ups, too) in your life. These taste amazing and much different than store bought! Make them and you'll see! In the bowl of a stand mixer with whisk attachment, pour 1/2 C of water and sprinkle the three envelopes of gelatin. Don't do a thing, just let the gelatin soak a bit. In medium saucepan over medium high heat, pour remaining 1/2 C water, granulated sugar and corn syrup. Stir and let boil for 1 minute. Remove from the heat. Go back to stand mixer, turn on low so gelatin incorporates with the water. Slowly add the hot sugar mixture with caution, it's hot! Turn the mixer to high for about 12 minutes. You will see the the beautiful marshmallow starts to form and grow. Stop mixer, add vanilla and coloring if desired. Whisk briefly to incorporate. Transfer this mixture to the prepared buttered pan with a spatula and spread evenly. Butter a sheet of plastic wrap and seal pan against the mixture. Let set overnight. Sprinkle confectioner's sugar on clean working area, separate edges of marshmallow and invert pan. Cut with serrated knife into 4 columns and from there, cut into squares. Work each piece and corner with confectioner's sugar. How many will you eat before sharing? You tell me!